From CLERC The most spectacular means of measuring success - Two central hands providing an original short-time display mode: such is the exclusive solution showcased by Clerc Genève in the Hydroscaph Limited Edition Automatic Chronograph. The first central sweep-seconds hand indicates the chronograph seconds, while its twin shows the minutes. This innovative display ensures exceptional readability for an instrument that tolerates no aesthetic or technical compromises. A prestigious timepiece designed for short-time measurements, the Hydroscaph Limited Edition Automatic Chronograph is the most spectacular means of celebrating success. 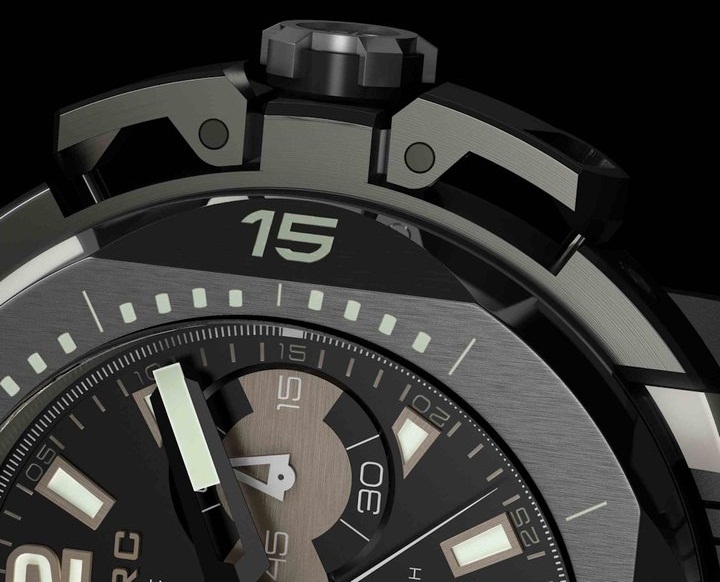 The Hydroscaph Limited Edition Automatic Chronograph is innovative in more than one respect. 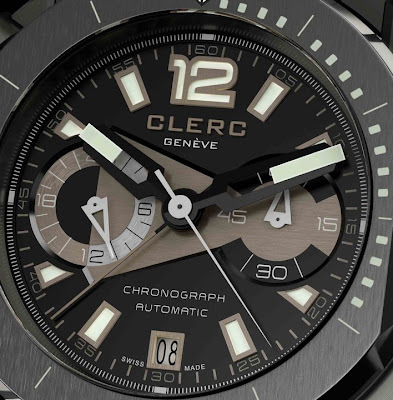 First of all, its exclusive Clerc C608 self-winding movement features a central chronograph reading offering a technical and original display of short-time measurements. There are no off-centred, barely readable subdials, but instead a sweep-seconds hand twined with a running central hand indicating the minutes. This original 60-minute display ensures exceptional legibility that is just as useful on land as in the darkness prevailing at great depths. 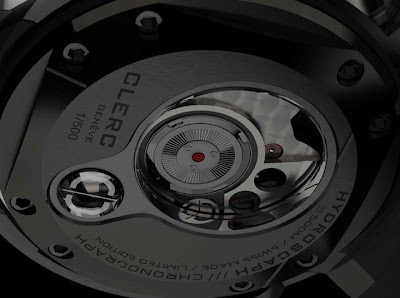 This mechanical movement beating at a high frequency of 4 Hertz (28,800 vibrations per hour) also drives the hour and minute hands, small seconds at 3 o’clock, a date display at 6 o’clock and a 24-hour day/night indication at 9 o’clock – a refined touch that proves extremely practical when adjusting the date. The exclusive Clerc Calibre C608 is hand-assembled according to with the highest Swiss watchmaking standards. 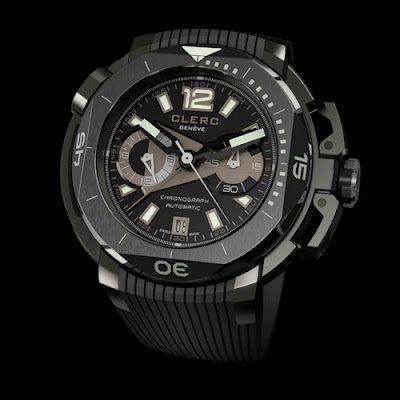 The multi-level dial features an ultra-technical yet ultra-readable face. 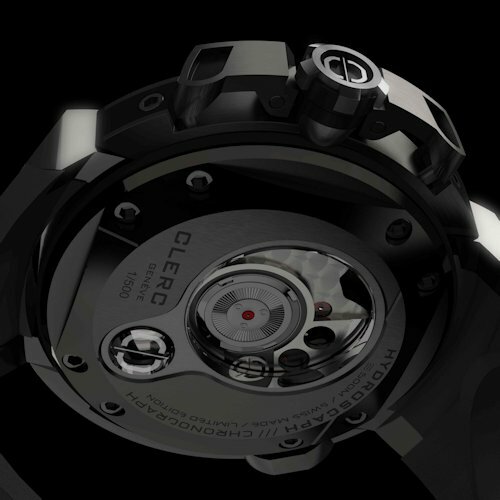 Each section of time read-off is perfectly delineated and visible even in the dark thanks to the Superluminova coating on the hands and hour-markers. The new Hydroscaph Limited Edition Automatic Chronograph is available in three finishes: high-density steel, black DLC (diamond-like carbon, an extremely hard and thermally stable coating) and 18K rose gold/black DLC steel). Each of the three versions, fitted with rubber or rubber-treated hornback leather straps secured by folding clasps, is issued in limited series of 500.